CD Sharma, DAZT Project Country Director participated on April 28 on a panel by the Clinton Health Access Initiative (CHAI) in Mumbai, India. The panel focused on public-private partnerships in India to end childhood deaths. 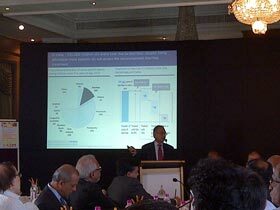 Sharma was invited to speak by Ray Chambers, UN Secretary-General's Special Envoy for Malaria. The panel was convened to focus on the one-year anniversary of the Every Woman Every Child campaign, a worldwide effort to secure the wellbeing of every woman and every child and advance MDG 4, Reduce Child Mortality. Sharma spoke about the DAZT project's goals to increase awareness and demand for zinc and ORS among providers and caregivers and to improve supplies to the points of care for childhood diarrhea. This project is significant because, in India, 235,000 children die every year due to diarrhea, despite the treatment's affordability. Other panelists included Ashok Alexander, Director India Country Office, Bill and Melinda Gates Foundation; Raymond G. Chambers, UN Secretary-General's Special Envoy for Malaria; and Alan Batkin, Chair, Child Health, MDG Alliance. While the Every Woman Every Child campaign has been making headway - with nearly 200 partners in more than 50 countries, the number of mothers dying from childbirth-related causes is decreasing and the number of children surviving beyond their fifth birthday is increasing - there is still much work to do to achieve the goal of saving 16 million lives by 2015.